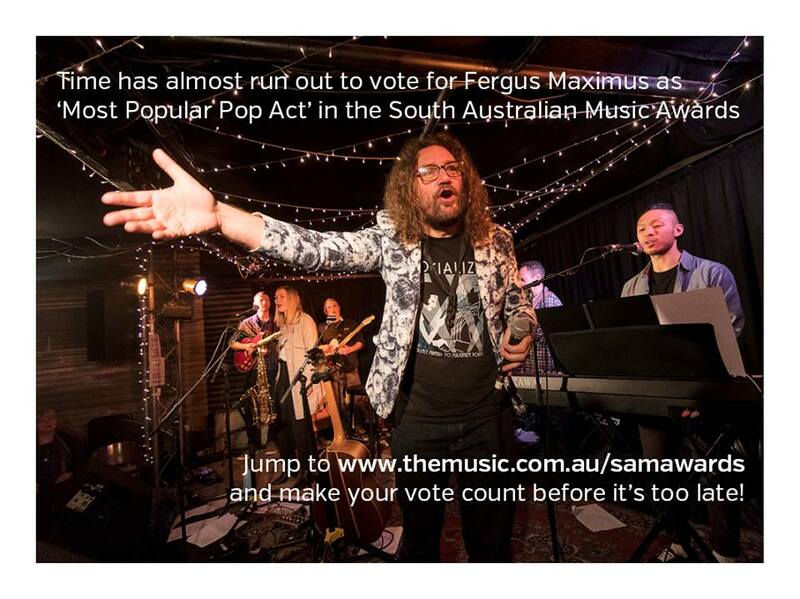 Bounce over to the South Australian Music Awards and vote for Fergus Maximus as “Most Popular Pop Artist”. It’s the only category with built in redundancy! It’s Pop Squared. How could we not love that? ‘Restless Soles’ is in the wild! After approximately forever, the debut studio album from Fergus Maximus, Restless Soles, was released on Friday, 13 July 2018 to a sold-out crowd at The Wheatsheaf Hotel in Adelaide as part of Music SA’s Umbrella Winter City Sounds Festival and Adelaide Guitar Festival’s Guitars In Bars, ably supported by the wonderful Alison Coppe. Restless Soles, recorded at Wizard Tone Studios in Adelaide, is an anthology of melodic short stories about people with itchy feet and the road in their eyes; about love, loss and memory and the things we hold on to. Musically, the album is really varied. There are bouncy pop things, some soulful tracks with a horn section and gospel-inspired backing vocals, some rowdy pop/rock songs, a couple of sparse ballads and a couple of things with strings including one track simply backed by a string quartet. But how do you get to hear the album? There are SO many ways! If you want a physical CD, come to a gig some time!. If you want a physical CD which includes a download go to the Fergus Maximus BandCamp store. If you just want a download you can get that at BandCamp too or at Amazon, Google Play or iTunes. Or you can stream it on Spotify or Deezer or Tidal or Apple Music or iHeartRADIO or Napster (apparently that’s still a thing) or in a whole bunch of other places we don’t even know about (we have people for that). If you can’t find your service of choice, just Google it. It’s probably there. If not, let us know and we’ll see if we can hook them up.